1. Cook the asparagus in a pan of boiling water for 4-5 minutes until just tender. Remove from the water with a slotted spoon and cut into short lengths. Keep warm. 2. Place 100ml of the asparagus cooking water in a small pan with the lemon juice. Return to the heat and boil rapidly for 5 minutes until reduced and syrupy. Whisk in the olive oil to create an emulsion and season. 3. Cook the pasta in boiling water for 4 minutes until tender. 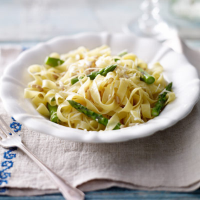 Drain and toss the pasta with the asparagus, lemon zest, pine nuts and reduced stock. Season and serve in warm bowls with the grated Grana Padano cheese, if you like. To make this dish vegetarian, omit the Grana Padano cheese. New Zealand Sauvignon is incredibly popular, and it’s never better than when paired with English asparagus: Waitrose Sauvignon Blanc, Villa Maria 2010 Marlborough, New Zealand.